This video slot machine is the sequel to one of the most successful Microgaming slot machines, Big Kahuna. This game will take players once again to the jungle where they can enjoy the wild life and accompany the wild monkey in a crazy jungle adventure where they can claim great rewards through the line payouts as well as the special symbols and bonus rounds of the slot machine. 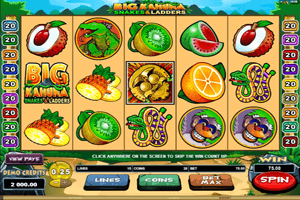 Play Big Kahuna Snakes & Ladders Slot here. Big Kahuna Snakes & Ladders is a Microgaming slot game that has all of the aspects that players would look for in an online slot machine. This includes great visuals, amazing sound effects and a long list of rewarding features. Starting with the visuals, the symbols that appear on the 5 reels and the 15 lines of the game include the wild monkey, a golden mask, a tribesman, a lizard and Caribbean fruits. The Logo of the game, Big Kahuna Snakes & Ladders, is the wild icon but it will not just replace other symbols to help players form a winning combo as it will also double all winnings it helps in creating. If it substitutes for symbols and create a winning combo during the free spins round, winnings will be multiplied by 4x.